The Smiths, Electronic, Bryan Ferry, The The, Crowded House and Kirsty MacColl. Just some of the many acts Johnny Marr has written songs with over the years. 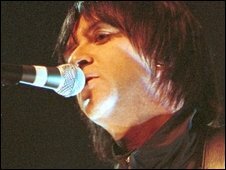 The former Smiths guitarist is currently a full-time member of Wakefield band The Cribs and was given the classic song writer award at the Mojo awards. So what's the secret to song-writing? Don't give up, don't be put off. They are not all going to be great, no matter who you are - it's hard. I love it. I've been lucky and had some ones that have been easy, and I've had some ones I've had to slog at. The secret is to know that there is no secret. There's no formula. I'm a collaborator really. What I do is try to get inspired 100%, hope that happens. Then hopefully you are working with someone else who is equally inspired, and then out of that comes something which is 300% because the combination of the two is something special. I had that with Kirsty MacColl a lot. I had it with The Smiths, with Morrissey - and I have it with The Cribs. Where's an unusual place you've written a song we'd all know? I've written a couple of songs on aeroplanes and I've written a song in a doctor's waiting room. It was the music for The Smith's track Stretch Out and Wait. Luckily for me, I've got a pretty good memory for chords and all of that. The weirdest thing was when I started writing a Healers song as I went on holiday one time. I was in the airport checking in and I hadn't brought a guitar with me. I had to remember the song for two weeks, while I was away on a really dreadful holiday, and every day I was just trying to remember this song. I kind of made life a misery for everybody I was with. I had to wait until I got home. I got out the taxi, into the house, out came the guitar and I played it and it was absolutely awful. I doubt it very much - unless he's interested in guesting with one of the bands I'm in. What's the best song you've written? The best song I've written is Get The Message by Electronic, with Bernard Sumner. It's great because I have no idea how it happened - I can remember starting with a bassline. Ten minutes later the backing track was done, and then this person who I find interesting and unfathomable came in and wrote these words which were interesting and unfathomable with an amazing atmosphere. It seemed like it belonged to somebody else. What was great about that song was that it didn't sound like The Smiths, and it didn't sound like New Order. That was why I thought we'd done something really unique. There are also some songs I've just written with The Cribs. One's called City of Bugs - that is, right now, a song I think is equal to Get The Message. You've worked with some unlikely people recently - Girls Aloud was unexpected. Yeah it was, it wasn't really work to be honest. I don't mean that in any disparaging way - I wouldn't have done it if I didn't want to. I heard a track and a producer said: "What would you play on that?" I said: "The track needs this," and I played it. Then I heard another track and I said you need to put some harmonica on that and I liked it. Off we went - it was great. Will you ever do live shows with Girls Aloud? (Laughs) With Girls Aloud? I don't think there's any danger of that. Will we ever see you on stage with Morrissey? I doubt it very much. Unless he's interested in guesting with one of the bands I'm in. I don't think that's going to happen really for some reason. Are you still in Modest Mouse as well as The Cribs? Modest Mouse has taken a vague hiatus, because Isaac the main guy is doing some music for a film. The thing with Modest Mouse is it's kind of a real bunch of super grown-ups. I can play with them any time I like. We live in the same town of Portland, Oregon and I probably will be popping up on a few of their records. I'm in The Cribs though. The Cribs is the band I get in a van with, go to soundchecks with and live with at the moment. As a Manchester City fan what is your reaction to Ronaldo going to Real Madrid for £80 million? As a person I just can't get my head around £80m being spent on any person. I think it's obscene. I think it's a disgrace personally. I can't really be glib about that - £80m on a sportsman - is he really that important? I don't think so. Some hospitals in India perhaps. 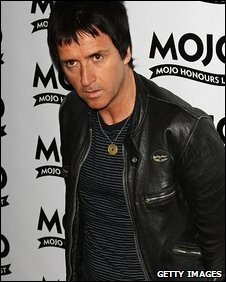 Johnny Marr was speaking to BBC 5 Live entertainment reporter Colin Paterson.